When we are tired of the hustle and bustle of the imperial city, the best place to go for us as well as for many locals is up to the roof. When dining in one of the city's rooftop terraces and bars, the atmosphere is cozy, very romantic and exciting. You should try! Rooftop Restaurants in St Petersburg, Russia, including a photo of us. If you too want to find a peaceful corner far away from the city's chaos during your visit, you will have plenty of lovely rooftop restaurants in St Petersburg to choose from. From many of them you will get stunning views of the most popular St Petersburg attractions and the city itself. Plus you will taste a variety of European and Russian dishes that will make your dining experience a special one. Of course, you won't experience a breathtaking panorama from great skyscrapers like in New York; and it is likely that the food served in these kinds of restaurants won't always be the best or the cheapest, but if your expectations aren't too high, the overall experience will certainly be great. To help you choose the right spot for a good meal with a great view, we've picked out what we think are currently some of the city's best rooftop restaurants. Hungry? If so, choose a restaurant from the list below. Just click on the links or scroll down to the bottom of the page. Good food, Nice View, Pleasant atmosphere! On the fourth floor of the Rosvuzdesign Gallery Glass you can delight in creative European dishes and indulge in several desserts in one of the most interesting rooftop restaurants in the city: the Artist's Attic Fondue Bar. Loved by many locals for its nice artistic style and cozy atmosphere, this small bar-restaurant offers a beautiful view and a really nice art exhibition space. If you visit this restaurant, don't miss their specialty - a fondue made of cheese, chocolate or exotic in boiling oil of your choice. On-line booking currently not available. Great view, Romantic atmosphere, Tasty food! The superb up-close view of St. Isaac's Cathedral that you get from the large roof terrace at Mansarda restaurant is one of the nicest in the city. Serving a mix of European and Asian dishes, such as pasta, sushi and grill dishes along with a range of traditional Russian salads and soups, your dining experience at Mansarda could be one of the best you've had, especially in the summer during the long days of the so called White Nights. Prices are quite high, but for the marvelous picturesque view, and great food, this is one of the best rooftop restaurants in the city. Вы владелец или менеджер этого ресторана? Свяжитесь с нами! European style-trendy rooftop Restaurant, Large terrace, Casual Food! Not too far from the famous Zenit Stadium you can find Makaronniki, a new Italian restaurant offering simple but delicious Italian cuisine combined with a nice atmosphere. With big windows and a glass roof, you can enjoy breathtaking sights throughout your meal. Seen as one of the trendiest rooftop restaurants in the city, this could be an ideal place to grab a drink or a meal with or without your family, especially in the summer when tables, a wooden gazebo, chaise lounges and colorful hammocks are put out on the large roof-top terrace. Relaxed food, Unique interiors, Good for all ages! On the top floor of the Grand Palace Boutique gallery is Chayka, a stylish and modern Russian restaurant offering a nice city view and an interesting permanent exhibition of Soviet times with posters and portraits of Stalin and Lenin on the wall. From the unique setting and live music to the large variety of European and Russian dishes, Chayka is a good alternative dining option for those looking for something different. Maybe it won't be the place you'll be talking about long after you've gone home, but surely it will catch your attention even before you are seated. A unique combination of modern, casual and elegant dining with special attention to the food! Would you like to eat like a celebrity? Want to see the city's glitterati? If so, you have to go to the famous restaurant Mix in St Petersburg. Rated as of the poshest rooftop restaurants in the city, this is the only restaurant run by the Michelin star Chef Alain Ducasse in Russia. If you go to this restaurant, you won't only enjoy a unique view of the imperial city but you will also experience the glamorous atmosphere and a large variety of tasty high-class European and French dishes that have made the Chef’s cuisine internationally famous. Classic upscale restaurant, Good Russian cuisine, Nice View! If you want to feel the spirit of the Russian aristocracy and eat like a royal while overlooking the dome of Kazan Cathedral or the large avenue Nevsky Prospekt, then you should have dinner at Victoria, one of the classiest rooftop restaurants in the city. Located on the sixth floor of the Taleon Imperial Hotel, here you can enjoy a superb view of the historic center of St. Petersburg while sampling traditional Russian dishes prepared according to rare recipes from the time of the Tsars. Definitely a unique place for a first-class dinner in a relaxed indoor atmosphere! Simple Russian food, Warm atmosphere, Hipster-Bohemian clientele! If you are on a limited budget or in search of the young artistic crowd, you should head to the roof terrace on top of the Loft Project Etagi Art Centre. Inside you will find the Green Room Cafe (Zelenaya Komnata in Russian), a simple cafeteria where the food and beer is cheap and the atmosphere is warm and welcoming. Serving simple traditional Russian dishes, like birch sap, mixed with local and bio-food from all over the world, this is the kind of place to hang out and pretend to be an under-funded bohemian artist. If you go, don't go just for the cheap food, but also for the art exhibition! Great choice of food, Relaxing atmosphere, Beautiful terrace! Another place to go for an excellent mix of atmosphere and food is Moskva City, a new laid-back restaurant located on the top floor of a 6-store business center on Petrograd side. Here, an Indian chef cooks everything from European to Japanese and pan-Asian cuisine, while welcoming staff make sure you feel at ease. The amazing panoramic view, soft background music, comfortable chunky sofas and central location make Moskva City a really superb place to enjoy dinner or lunch with anyone at anytime. Beautiful interiors, Casual food, Wonderful atmosphere! Luce is the right place to go for anyone looking to combine a wonderful atmosphere with a fabulous panoramic view. From the impressive glass roof you can admire the popular Church on the Spilled Blood, Arts Square, Russian Museum and the Mikhailovsky Castle. Located on the top floor of the upscale Gran Palace boutique, this stylish Italian restaurant seems to be more famous for its views than for its size-zero portions of food. Great service, Delicious food, Sublime view! From a mix of well-cooked Russian, Asian and Italian dishes to a sublime view of the Malaya Neva, you won't be disappointed at Ryba. Situated on the top floor of a business center this trendy cafe-restaurant is very popular among the rich and middle class Russians. If you go, don't miss the salad Olivier in the classical Russian style or the "wok with chicken" or "wok with seafood", two delicious Asian dishes of their own making. Nice charming place for dinner and late night drinks! Seen as one of the most awe-inspiring rooftop restaurants in the whole of old St Petersburg, the Bellevue Brasserie is a nice spot for a romantic dinner or drink with a view. Offering a unique dining experience in a casual and elegant setting, here you can taste a variety of international dishes crafted by a local French chef and served by professional and smiling staff. Situated on the top floor of the Kempinski Moika Hotel, the great view of the Winter Palace and their French cheese plate will keep you coming back for more. Nice restaurant, Great location, Best view of the city! 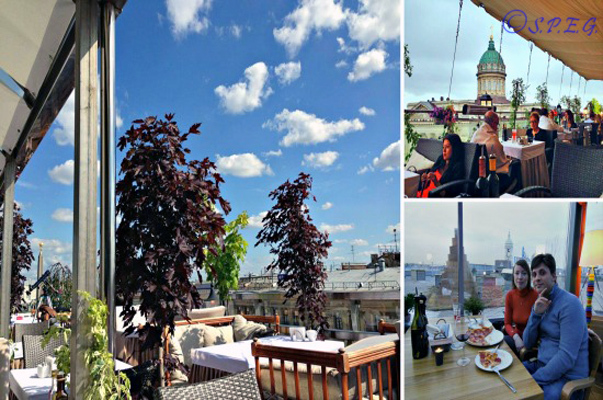 The fabulous open terrace sprawling across 350 square meters with gorgeous views of the Kazan Cathedral and Nevsky Prospekt makes Terrassa one of the hottest rooftop restaurants in St Petersburg Russia. Serving various cuisines from all over the world with the creative touch of famous local Chef Alexander Belkovich, here you will feel like you're eating in the sky. Definitely a unique dining spot to top off your evening and enjoy an unforgettable atmosphere with your family, friends or loved one. Expensive but worth all your money! Definitely, one of our favorite rooftop restaurants in the whole city!